Avery Clayton lived long enough to find a home for the largest collection of African American artifacts on the West Coast. But not long enough to see the treasure trove of rare books, manuscripts, photographs, feature films and ephemera, his mother's life's work, made available to the public. 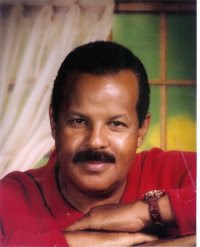 Mr. Clayton died suddenly on Thursday, while hosting a Thanksgiving dinner. He was 62 years old. Clayton's mother, Mayme, spent 40 years amassing materials on African American history from every source imaginable: garage sales, flea markets, attics, used-book stores, and even dumps. She rescued thousands of rare books, movies, sound recordings, photographs and letters documenting the Black experience in America, which otherwise might have been lost to scholars forever. Until Mayme Clayton's death in 2006 this priceless archive was stored haphazardly in her garage in the West Adams section of Los Angeles. Avery Clayton, the eldest of Mayme's three sons, began to see the value of his mother's "hobby" when he became a teenager. "Her part was to assemble the collection," he said. "I really believe my part is to bring it to the world." 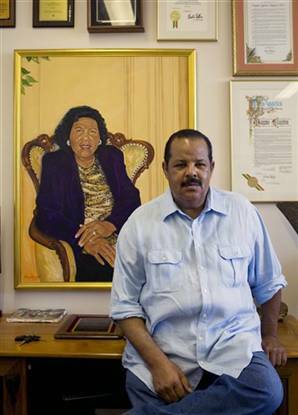 Just days before his mother's death, Mr. Clayton signed a $1-a- year lease on a former courthouse in Culver City, CA., to house what is now the Mayme A. Clayton Library and Museum. Since 2006 he had tirelessly raised funds to catalog, preserve, conserve, and display the collection and make it accessible to the public. He also personally helped to archive many of the items. He had hoped to see the Library open in 2010 or 2011. Avery Clayton seated before a portrait of his mother, which he painted for her 80th birthday. The first exhibit of materials from the Library was organized just this year, in conjunction with the Huntington Library in San Marino, CA. Central Avenue and Beyond: The Harlem Renaissance in Los Angeles opened in October and will continue at the Huntington through February 8, 2010. Director of Literary Manuscripts at the Huntington Library, Sue Hodson, co-curated the exhibit with Avery Clayton. She noted that selecting materials for the show was "a great time of discovery" for Clayton because most had been collected while he was a child. "He had such a dream and a vision and a passion for what he was doing," she recalled. Avery Clayton's original dream was that his mother would see a library named for her, holding her amazing collection, "in her lifetime." That did not come to pass. Now Mr. Clayton's death means that though he accomplished the minor miracle of finding a home for the Mayme A. Clayton Library, he will never see public benefit from his unfailing devotion to her legacy. 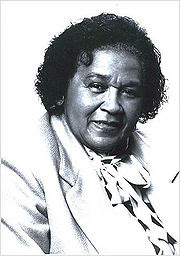 Information about becoming a member of Western States Black Research and Educational Center, the non-profit organization that supports the Mayme A. Clayton Library and Museum, is available at the Library's website.